The PGAA proudly recognizes Pitt-Greensburg alumni for their professional accomplishments, service to their communities, and commitment to the University. Nominations for the prestigious Alumnus of Distinction, Volunteer Excellence, and Young Alumni Leadership awards are being accepted now through Monday, July 8, 2019. To learn more about the award criteria, guidelines, nomination forms, and the 2018 PGAA honorees, please visit this Web page. Preview Pitt: Saturday, April 6, 112:30 p.m. - 1:30 p.m. Commit to Pitt: Saturday, April 13, 11:30 a.m. – 12:30 p.m.
To volunteer for admissions events, please visit this link. Senior Sendoff: Step out for a night in Greensburg on Sunday, April 14 and get to know the graduating seniors. This casual get together is a fun way to mingle and celebrate with the Class of 2019. This free event includes appetizers. The event will be held at Rialto in Greensburg from 6-8 p.m.
New Alumni Reception: On Friday, April 26, the PGAA hosts another informal opportunity for alumni, staff, faculty, students and their families to celebrate commencement. Held in the Alumni Pavilion at 4 p.m., come enjoy picnic food and good company before everyone heads into Chambers for rehearsal. Family Appreciation Dinner: Following rehearsal, the PGAA welcomes the graduates and their families at this event. Alumni volunteers will act as hosts at each table. Dinner is included for all alumni volunteers. This event starts at approximately 7 p.m. Alumni Leadership Meeting: The PGAA Board of Directors invites all alumni to join them for this 8 a.m. meeting in Lynch Hall. PGAA President Jim Smith ’75 will review highlights from the 2018-2019 academic year, and Dr. Sharon Smith will also share campus updates. A light breakfast is served. To register for commencement activities, please click here. Pitt-Greensburg @ PNC Park tailgate and ballgame return again this year. Join The PGAA on Saturday, June 1 for a pre-game tailgate and a 4:05 p.m. game against the Milwaukee Brewers. The first 20,000 fans will receive a Chris Archer bobblehead. Purchase your tickets by April 15 to get the $30 early bird price and and a hance to win two tickets. Beginning April 16, tickets will be $35. Purchase your tickets here. 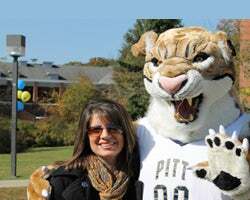 Pitt Networking Day -- Join Us! Join the PGAA for Pitt Networking Day on Thursday, June 6 on the patio at Applbee's (Westmoreland Mall) from 6- 8 p.m. All local Pitt alumni are welcome. Registration details coming soon! Pitt-Greensburg Alumni Affairs and Admissions offices are collaborating on the implementation of an Alumni Campus Tour Team. Come share your memories and knowledge of Pitt-Greensburg with prospective families. Alumni are asked to be included on a call list for needs that arise individually and as part of Admissions' events. A training session will be scheduled. Click here to register or contact the Office of Alumni Relations at 724-836-7496 for more information. Select a recent event to click through photo slideshows of recent events! Check back often for event photo updates!